I'm A Reader, Not A Writer. 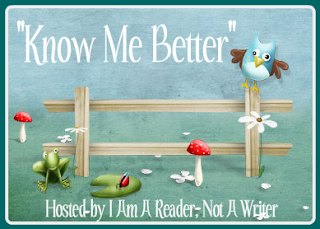 Each week she answers five questions from her author interview list, and invites us to join in the fun as a way to get to know each other better. If you would like to join in please comment on this post, or share on your own blog post and link up below. My hubby and I don’t tend to eat out much as we have two young children. If we do go out it’s to the local Chinese. When we get takeaway it’s usually from the Thai place up the road – Bambu Thai and Indonesian. I think self-publishing is wonderful. It has given so many aspiring authors the opportunity to live their dreams, but it needs to be done right. I know firsthand how much hard work is involved in travelling the self-publishing road, and short cuts shouldn’t be taken, otherwise you’ll find yourself off the path, surrounded by a dark forest with an angry dog about to attack you. Well, not really, but you get the idea. Self-publishing is as I said hard work, but it’s also extremely rewarding. How do you feel about banned books? Do you have a favourite? I think every book has a place. It comes down to the fact that we all have the ability to make our own decisions. If you know you won’t like something, or you don’t agree with what a particular author has written about, don’t read it. Whatever happened to freedom of speech? Isn’t writing a form of expressing our opinions and ideas? My favourite banned books would be Alice In Wonderland and the Harry Potter series. I’m all for it, but it has to be done well. I pretty much always enjoy the book more than the movie, and I get upset when things are changed or left out. But, there have been some fantastic adaptations. The Hunger Games is a favourite, as are all the Harry Potter movies. One that springs to mind that was a huge disappointment was I Am Number Four. Such a great book, not so much a great movie.